The Bala Mill slalom site is on the dam regulated river Tryweryn, half a mile from Bala. With a deep pool below the Mill Falls it provides a year round training and competition site regardless of water release from the Llyn Celyn dam. Bala Canoe club owns the site on one side of the river and has access to a 500m stretch of water for slalom gates and a further 600m of flat water down to the road bridge in Bala. Bala Mill falls provides the main feature of the Premier and Division 1 course and can only be used with a flow over 9 cumecs. The rapid falls out of Rhiwlas pool and consists of progressively technical white water for 75 meters, culminating in a rocky drop guarded by a large haystack wave and a cross flow that also drops down the chicken shoot, which is used by wild water racers as an alternative to the main drop. The site below the falls consists of a pool hosting the training site and division 2, 3 and 4 slaloms. This can be used at any water level, but with a release of 9 – 10 cumecs provides a tongue of fast water, some quick eddies and features and a steady flow to the bottom of the course with a small chute at the egress. On a winter release of 5 cumecs it makes a good training venue under floodlights, with 20 gates giving plenty of variation for technical and physical workouts. The site is owned and managed by Bala Canoe Club, and includes a large field for parking and occasional camping. The club has over 100 members, of whom 20–25 take part in regular slalom sessions on Tuesdays and Wednesdays at the Mill, Saturdays at Canolfan Tryweryn and on the lake on Mondays. The club also runs freestyle, whitewater and lake sessions on Fridays. Any monies raised by the club at events are used to develop the site, keep the road and paths in good condition and maintain a building with toilets and a kitchen. Following a spate of vandalism a few years ago, the club building has been required to have a tenant there, so please respect the property if you are using it for races or training and keep to the public footpath or river bank. If you want to use the site for training, groups can contact Chris Leesmith at Paddleworks in the High Street in Bala, while individuals can join the club - contact Richard Lee on 01678 520337 or richardlee.wca@virgin.net. 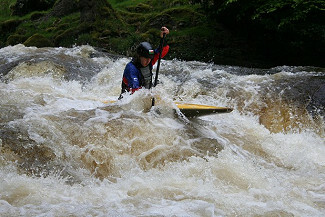 Alternatively you can buy a ticket at Canolfan Tryweryn and enjoy 5½ miles of fresh whitewater 200 days of the year, with releases most weekends between March and October. Check the water info line on 01678 520826 for release information. Turn off the A4212 400m from the A494 turn off to Porthmadog/Trawsfynydd. The track to the site is opposite the artificial sports pitch, between the turning into Cysgod y Coleg estate (you cannot access the site if you turn into the housing estate) and the College on top of the hill. Please take care on the access road – many children play along it. D: ‘Real’ slalom water. Beginners will need some practise to handle this, and some bravery simply to paddle down it.